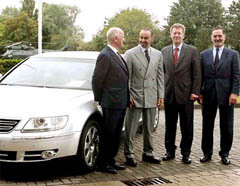 Berlin (WAM) — Lt. Gen. Sheikh Mohammed bin Zayed Al Nahyan, deputy crown prince of Abu Dhabi and chief of staff of the UAE armed forces visited here July 12, 2004 the Volkswagen Group's factory at the German State of Lower Saxony. Sheikh Mohammed, who is currently on a visit to Germany, was accompanied by Maj. Gen. Sheikh Nahyan bin Zayed Al Nahyan, commander of Emiri Guards, Sheikh Hamed bin Zayed Al Nahyan, chairman of the Sheikh Hamed bin Zayed Al Nahyan, member of the Abu Dhabi Executive Council and chairman of the Abu Dhabi Economy Department, Sheikh Abdullah bin Zayed Al Nahyan, minister of information and culture and Ahmed Al Sayegh, member of the Board of Directors of the Abu Dhabi Government-owned Mubadala Development Company. During his visit, Sheikh Mohammed met with Lower Saxony prime minister, Christian Wulff and Volkswagen CEO Bernd Pischetstrieder. They discussed relations between the Mubadala Development Company and Volkswagen and further explored the prospects of auto industry in Abu Dhabi emirate. The Abu Dhabi government-owned Mubadala Development Company joined hands with Germany's Volkswagen Group and Saudi Arabia's Olayan Group to buy the Dutch fleet management giant LeasePlan Corporation for 2 billion Euros. Based on the move, which is one of the most significant deals in the international fleet management market, Mubadala will own a 25 percent stake in LeasePlan and the Olayan Group will also have a 25 percent shareholding in the company, while Volkswagen will own the remaining 50 percent. 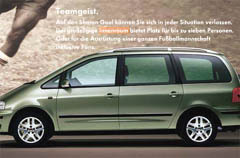 The LeasePlan acquisition follows the signing of a memorandum of under-standing (MoU) between Mubadala and Volkswagen in October 2003, which laid the foundation of a mutually beneficial business relationship between the two parties and called for exploring opportunities for setting up joint ventures in the UAE, the GCC and around the world.